Beadiste: Puzzling Evidence - A Helen Burton Champleve Connection? Puzzling Evidence - A Helen Burton Champleve Connection? Helen Burton was proprietor of The Camel Bell gift shop in the Peking Hotel during the 1920s-30s, and a notable prisoner of the Weihsien internment camp during the early years of World War II. Donald Menzies (now sadly passed) wrote an informative biography of Helen, which includes a Life magazine photo of her wearing a 30s-style necklace and dramatic bracelets. The photo was taken during a sad occasion; nonetheless, Helen is neat and stylish despite having just been released from two years of prison camp and recovering from pneumonia. A remarkable woman. 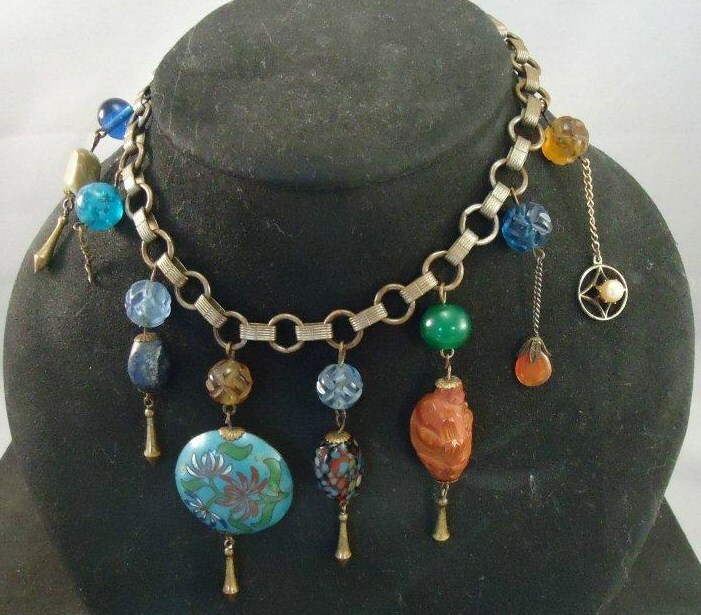 A possible example of the type of jewelry Helen sold at The Camel Bell and its auxiliary shop on the passenger ship Empress of Britain was featured on eBay, and is of interest because it still had the original box with a Camel Bell label. 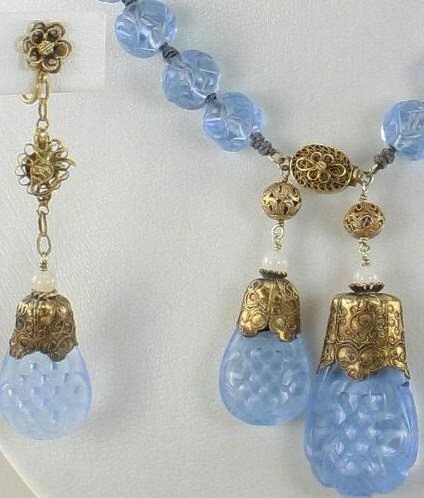 Note the use of carved blue glass beads and drops typical of those used for Qing court necklaces. 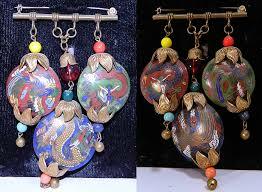 1) They are not wired cloisonné. That is, unlike the other beads, the cloisons are not formed by thin strips of copper wire; instead, the cloisons are all perfectly identical, and are specimens of the champlevé technique. 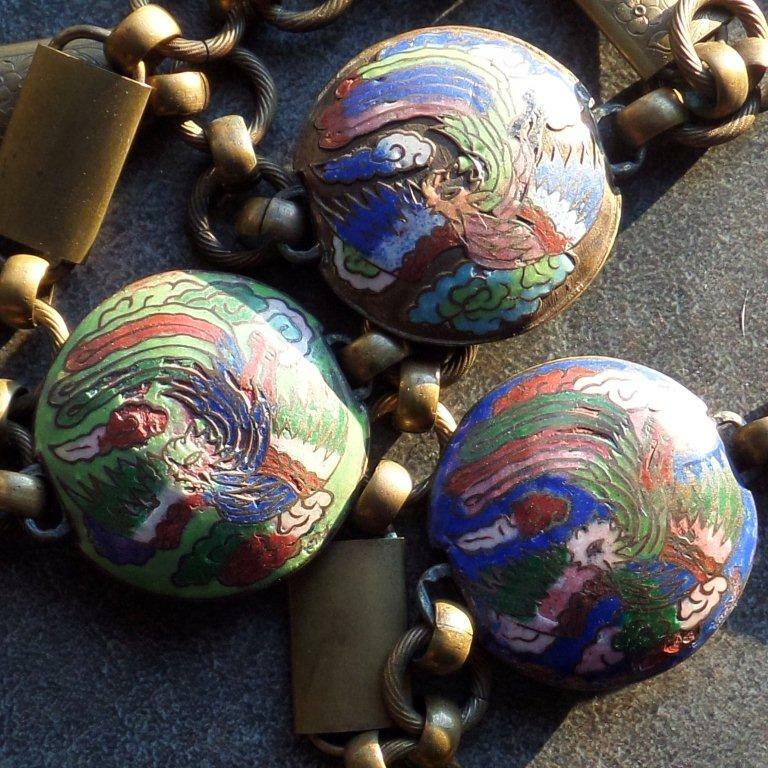 I have no idea how the designs were reproduced – stamping from a die seems most likely, as this technique shows up in other Chinese cloisonné right up the present. In other words, the design was not outlined by thin copper strips, but instead stamped or etched; the only difference from one bead to another is the colors of enamels that were subsequently painted into the design holes and background. Here is a little bracelet featuring champlevé bells – note how the interior view shows what seems to be a stamped pattern [possibly Thai?]. And here is a more recently manufactured small round box offered by eBay vendor liwz88 that shows the technique very clearly. Because of the transparent enamels, I suppose this particular piece could also be called basse-taille - but the point remains that the cloisons were formed mechanically, not by hand, and can be exactly reproduced from one piece to the next. 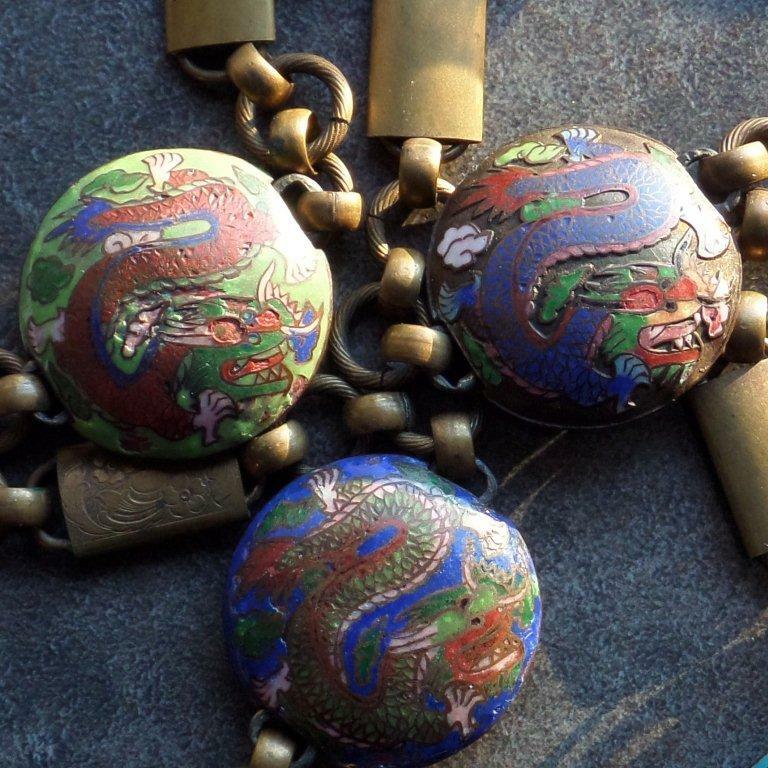 2) The dragons are not drawn in the stereotypical style that shows up in the other beads, as described in a prior post. 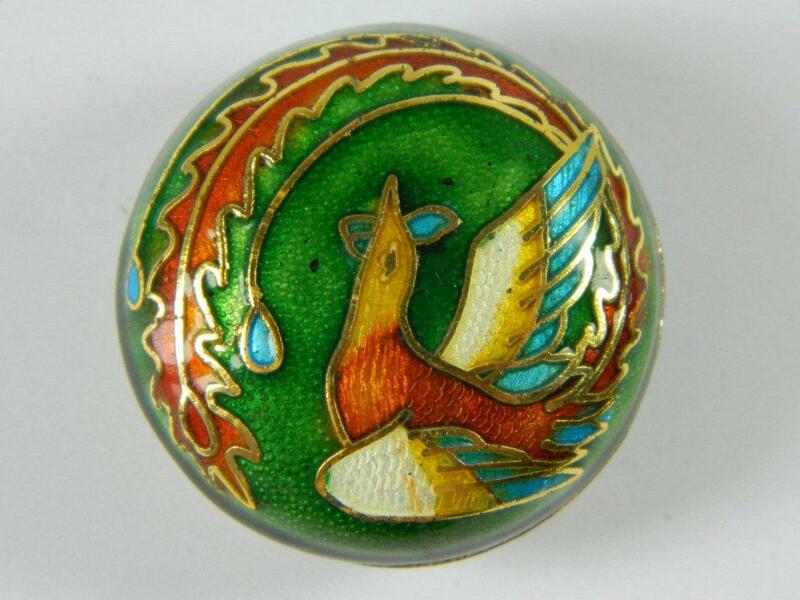 Here’s a similar dragon design offered by eBay vendor, featuring transparent enamels reminiscent of the Canton enamel technique. Interestingly, this piece is listed as a Japanese obidome. 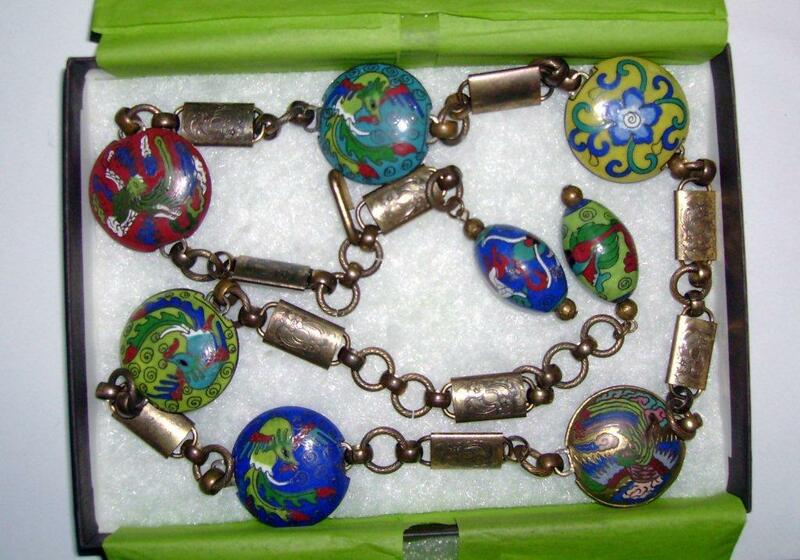 And recently on eBay, a silver brooch featuring this champlevé dragon design in a round brocade-covered cotton-filled box that appears to be similar in style to the Camel Bell box that accompanied the blue glass beads necklace and earrings. In the biography by Don Menzies cited above, in a letter Helen says that she sent a shipment from her shop to Rhode Island in 1937, just prior to the Japanese invasion of China. 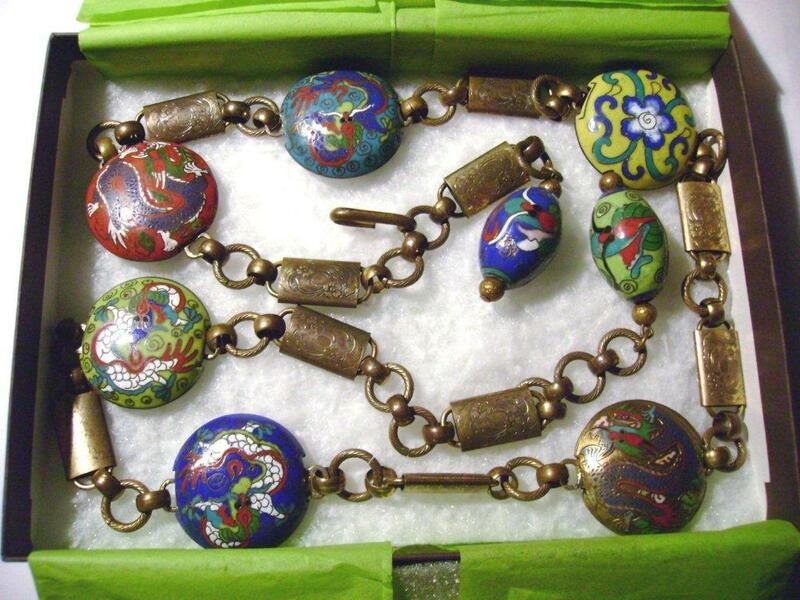 A possible origin for these cloisonne beads, belts, and other jewelry?